Depending on the weight loss plan you’re following, you may have sworn off a number of foods for a variety of reasons — perhaps they don’t fit into the diet our cavemen ancestors ate, your friend told you that she read a certain food is terrible for you, or some celebrity said she effortlessly dropped her baby weight by cutting this one food out of her diet. Whatever your reason for eliminating certain foods from your daily diet, we’re sharing why science supports adding these wholesome foods back into your eating plan. Learn how to get more Omega-3s in your diet. Avoiding this fruit because it’s high in sugar and carbs? While you shouldn’t eat a few of these a day if you’re trying to lose weight, a banana is a wholesome, healthy snack, yogurt topper, smoothie base, and a good-for-you way to satisfy your sweet tooth. This fruit is a good source of vitamins, minerals and contains fiber — which many of us could use more of in our diets to feel fuller on fewer calories. And if you’re satisfying that hankering for something sweet with a piece of fruit — instead of candy, doughnuts, cakes or desserts — you’re more likely to lose weight. Banned bread from your kitchen because it doesn’t fit into your low-carb lifestyle? Eating whole grains instead of refined grains could help speed up your metabolism and assist in weight loss. If you’re not eating whole grains in the form of whole wheat bread products, oats, barley, and brown rice, you might be missing out on important nutrients like fiber, B vitamins, and minerals. One whole wheat slice of bread might have between 12 and 20 grams of carbs, so you should still be able to reduce some of your daily carb intake and work this grain into your meals and snacks. Passed up the guacamole because you’re concerned about avocados being high in fat and calories? They have good-for-you fats in the form of monounsaturated fatty acids and polyunsaturated fatty acids. One study found that when people ate more polyunsaturated fats over saturated fats, they had more gains in muscle mass and less body fat than people in the study that ate a similar amount of saturated fat. Another study found that avocado consumption was associated with a better diet quality and nutrient intake overall. Slice one-third of an avocado to serve with your omelet in the morning, toss one-fourth of a cup into a mango smoothie, or dip fresh veggies into guacamole for a filling snack that will keep you satisfied. If you have cast off potatoes because you think they’re “bad carbs,” it’s time to rethink how you eat spuds in order to lose more weight. Potatoes contain resistant starches, which means they “resist digestion” and get digested slower, so your blood sugar levels remain stable and you feel fuller for longer. To reap the benefits of potato’s resistant starch properties, bake or boil it and then allow it to cool. Turn it into a potato salad and serve it with a lean grilled protein. Research has shown that when resistant starch was served with protein it enhanced fat oxidation and feelings of fullness in both lean and obese women. Smear a tablespoon of natural peanut butter onto your whole wheat toast in the morning or add it to your smoothie for a source of good-for-you fats in the form of monounsaturated fatty acids (MUFAs). These natural fats can help you lose belly fat, particularly the deep, dangerous visceral belly fat that can surround your organs. If you said arrivederci to pasta during a low-carb diet phase, welcome this Italian staple back into your lifestyle. You can eat pasta and still lose weight. There, we said it. 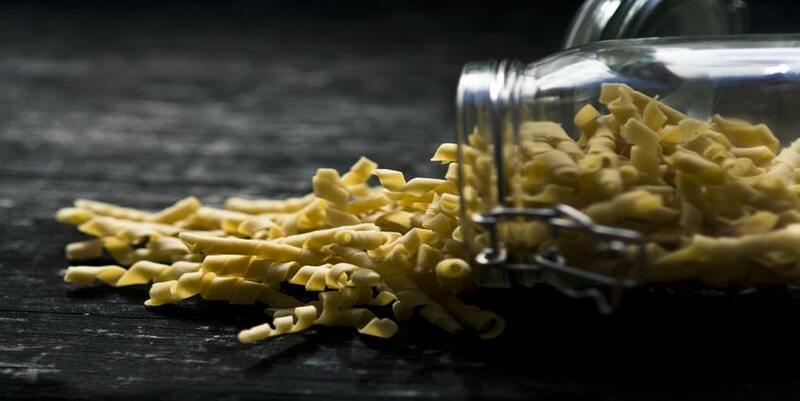 The trick is to keep your pasta portions in check, eat whole grain pasta whenever possible, and round out the meal with lean proteins, lots of veggies and lighter sauces. Whole grain pasta will fill you up so you feel satisfied. Depriving yourself of something you love to eat is only going to set you up for failure later — when you binge on a huge plate of creamy pasta and feel guilty about it and then ditch your healthy eating habits. Besides that whole grain study we mentioned earlier, other observational research shows that diets with whole grains in them are associated with lower body mass indexes (BMIs) and improved cardiovascular health. So have pasta tonight! Just make sure it’s whole grain and keep your serving size to one cup.